How Do I Repair A Loose Wall Anchor Hole That Has Fallen Out Of Drywall Or Wood? Your curtain rod bracket, toilet paper holder, towel bar or picture frame wall anchor has been pulled out, fallen out or has become loose, how do you fix this? First of all the reason it fell out was because you installed or attached it into drywall. Drywall anchors are fine for many uses and applications, but if people will be pulling indirectly on the object it can loosen and fall out over time. When we say “pulling indirectly” we mean a towel bar, curtain rod or toilet paper holder. These items can be loosened from the wall as they receive indirect force on them daily. A picture frame usually does not fall out of a wall because it is never touched. (Here is a Drywall Anchor Animation to help you better understand a plastic drywall anchor.) 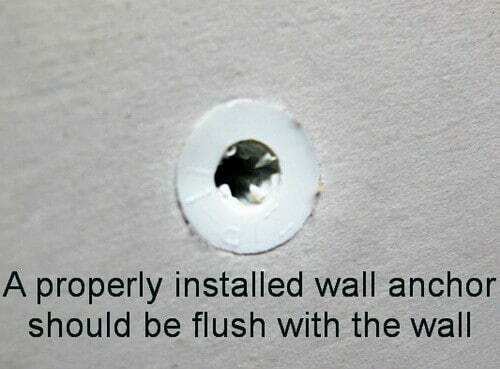 The BEST fix for something that has fallen out of the wall is to install the towel bar or whatever you are reattaching into a Stud. 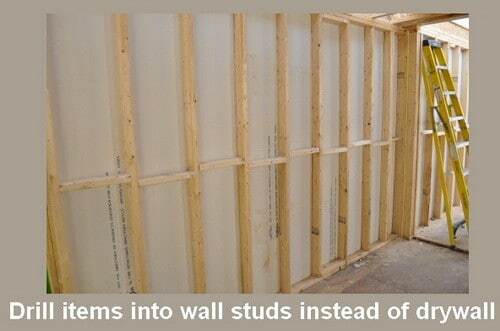 A stud is the part of the interior wall that is wood. Normally this is a 2×4 that is supporting your walls and this is what the sheet of drywall is screwed into to hold it in place. 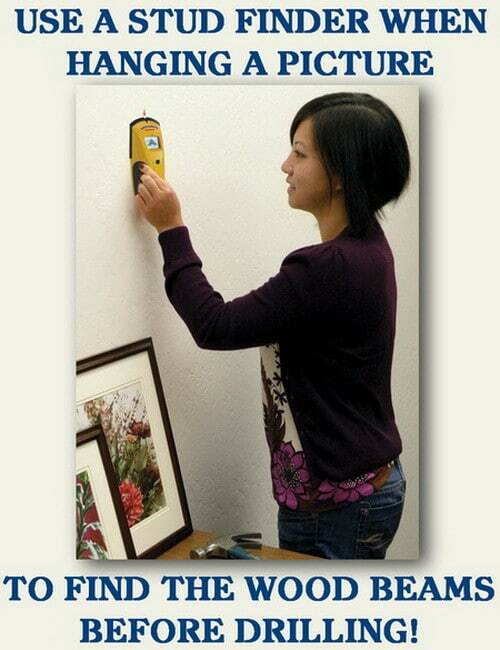 You can purchase a stud sensor or electronic stud finder and use it to find the wood stud in your walls. 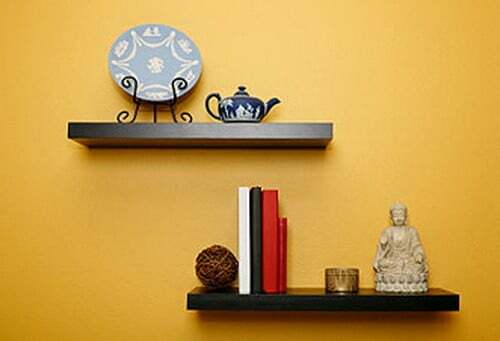 Normally a wooden wall stud is placed every 16 to 24 inches so if you are able to move the object that you need to hang a few inches to the left or right, you can attach the object into wood instead of drywall. If you do install the item that you are reattaching into the wooden stud, you can use normal wood screws or drywall screws to secure it. Just make sure they are long enough to go deep into the wood and support the item you are hanging. If you cannot attach the item into wood and your only option is installing into drywall, then read on and see below. If you have no other option and have to install into drywall, then here are a few options and tips. 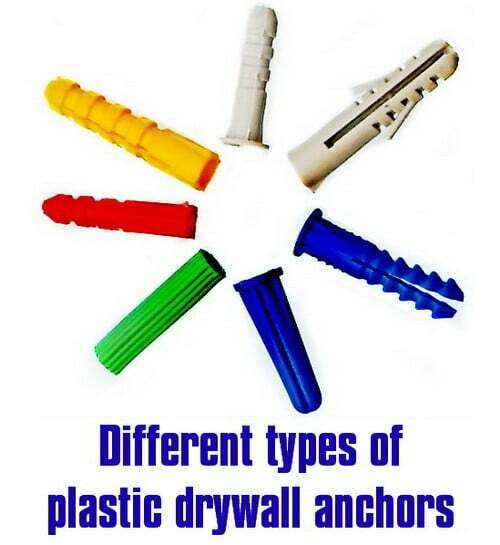 First, a self drilling plastic drywall anchor is the most common for securing something into drywall. If you are installing a picture frame or wall decor, then this is your best option. Just make sure to install them properly and use 2 or more if the picture frame or wall decor is large and heavy. 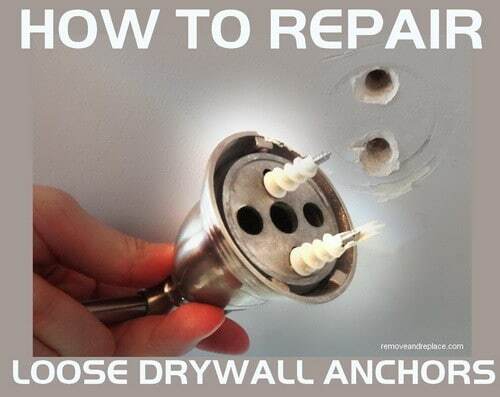 If you drilled holes into your wall that are too big for the plastic wall anchors to be snug, you can re-drill the anchor holes a few inches away from the originals (and fill in the mistakes or loosened holes with drywall spackle). NOTE: Make sure to leave enough space in between the old loose holes and the newly drilled holes to avoid causing a weak point by not leaving enough drywall in between them. If you are using normal plastic wall anchors and not the self drill type, make sure you are NOT using a drill bit that is too fat or wide. Choose a drill bit that is about 1/3 the thickness of the plastic anchor so that the hole will be tight enough for the plastic anchor to not loosen and fall out. 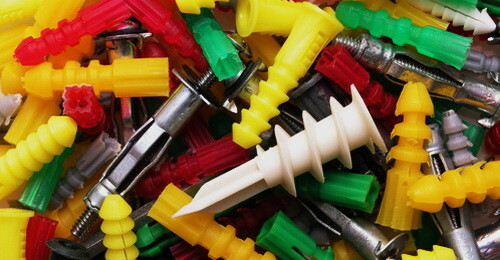 Once you have your holes drilled, take a hammer and lightly tap the plastic anchors into the holes you just drilled. 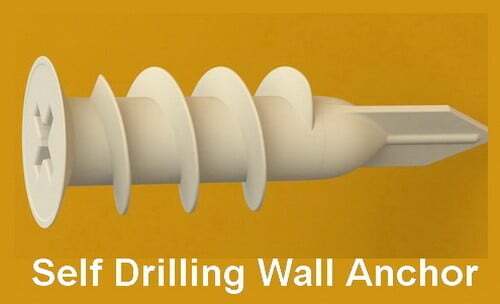 If you are using the self drilling type then just simply screw them into the wall. Once your anchor is in place, screw the metal screw into the anchor and hang your picture frame or wall decor art. When attaching a towel bar, curtain rod drape bracket or toilet paper holder into drywall, the best type of wall anchor to use is a Toggle Bolt. 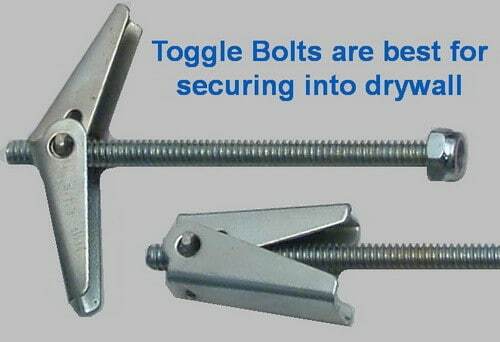 A toggle bolt fits through the drywall and a spring loaded wing nut “opens up” and securely locks the bolt in place. First drill your hole using an electric drill. The hole you will need to drill in your drywall when using a toggle bolt will be larger than you think so read the package that contains your toggle bolts for the proper size drill bit to use. Once your hole is drilled into the drywall, slide the toggle bolt into the hole of the bracket of the item you are hanging (such as the bracket hole on a towel bar or whatever you are hanging). On the other end of the toggle bolt, attach the spring loaded wing nut on the very end of the bolt to allow for the spring loaded nut to get behind the drywall. 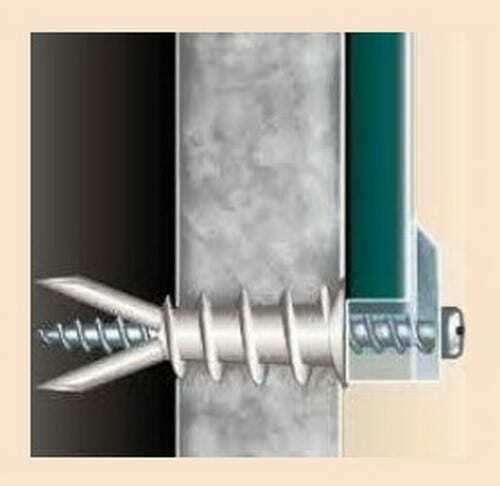 Carefully slide the spring loaded end of the toggle bolt into the wall far enough for the spring loaded nut to “open” and secure itself behind the drywall. Lightly pull on the toggle bolt to make sure it has sprung open and is secure. If it does not pull out of the wall after you pull on it, then begin to slowly tighten the toggle bolt until it is tight, snug and secure. Repeat this with any other items that need secured to your wall or items that have the probability to become loose over time from people pulling on them. Mounting a cornice, 70″ across. Any special hints? Depending on weight, use the proper hardware to mount. What are you planning to use to attach the cornice? What type of wood or material is it? Thank you very much to whomever explained toggle bolts so clearly. I was trying to place a ceiling hook using a toggle bolt. I made the hole using a large screw since I didn’t have a drill, got the toggle bolt placed but was disappointed when it fell out once the hook was screwed tightly. I found this site, and discovered that I had put in the toggle bolt upside down. Needless to say, I am not very handy but thanks to sites like this one, I am getting better. The hook is now placed. I hesitate to say what is hanging from it – a ceramic toucan!